With two world leaders discussing the size of their nuclear arsenals and their willingness to use them, it’s poignantly appropriate that Sunao Katabuchi’s “In This Corner of the World” is opening in stateside theaters after its successful Japanese run. A dramatic animated film set in Hiroshima and Kure, mostly in 1944 & 1945, Katabuchi’s adaptation of the award-winning manga by Fumiyo Kouno is an elegant reminder that we can never forget what life during wartime does to the human soul. Late in the film, our protagonist says, “I wanted to die a daydreamer.” That’s what war does: it takes away one’s ability to dream by making reality too oppressive for the light of imagination to find its way through the darkness. 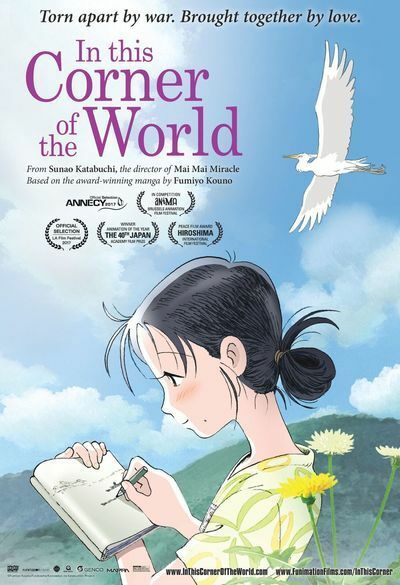 “In This Corner of the World” is the story of Suzu Urano, an artistic, kind, supportive young woman who moves to Kure, a small town just outside Hiroshima. Using thousands of photographs of the era, Katabuchi artistically and yet realistically recreates the area in the ‘30s and ‘40s. The film is constantly reminding us where we are in history with on-screen dates, almost like a journal, and, of course, everyone knows what happened in Hiroshima on August 6, 1945. It’s that knowledge of history that brings an understated poignancy to the first half of “In This Corner of the World,” as it really just captures countryside life in Japan before the world changed forever. While most of the film takes place in 1944 and 1945, we do get to see life in Hiroshima in the ‘30s, and it’s a lovingly detailed recreation combined with a sense of the beauty of the natural world clearly inspired by Katabuchi’s work with Hiyao Miyazaki at Studio Ghibli (Katabuchi was assistant director on “Kiki’s Delivery Service,” and worked at Ghibli on other projects as well). In a structure that’s sometimes too episodic, we really watch a coming-of-age story as Suzu develops her personality and lives everyday life in pre-WWII Japan. So, there are a lot of scenes that play out like anecdotes a woman would tell her grandchildren about how she learned to cook, make a kimono, draw a fish, etc. It can sometimes lead to an erratic rhythm that verges on being too slow. This kind of episodic storytelling works masterfully in a manga, as stories and imagery are more structurally self-contained, but film requires a different flow. However, patience in the first half of “In This Corner of the World” is rewarded in the second. As air raids and rations become a part of daily life in Hiroshima, Suzu’s story becomes more heartwrenching and tragic, and yet Katabuchi never loses the visual beauty of the film. There’s a striking centerpiece sequence in which Suzu is out during an attack, and Katabuchi transposes shots of explosions across the sky with painterly images, turning the bombs falling into brush strokes on a canvas as blue as sky. It works with Suzu’s artistic talent, but it’s also almost a meta-commentary on the film itself, blending art and history. From there, “In This Corner of the World” becomes more and more harrowing. Rations get more limited, the area is bombed more often, and Suzu faces horrific tragedy. Suzu experiences an injury at one point that I won’t spoil, but that almost becomes a commentary on Japan since World War II, moving on but forever altered, never quite the same as it was before. Ultimately, “In This Corner of the World” is a stark reminder of what wartime does to those ethereal elements of humanity that we truly need to survive: dreaming, art, love, etc. We are all lessened by war. Even if “In This Corner of the World” ends on a note that imagination and hope can continue, it would serve our world leaders, two in particular right now, to watch this before allowing the horror of war to repeat itself.